Brittney and Morgan tied the knot on Saturday March 31st with lots of style. Brittney is our in house Yoga Instructor, so if a bridal party wants to do yoga on the morning of the wedding Brittney will come in and teach a yoga class. Brittney wore a stunning two-piece dress, making her look extra trendy for her wedding. Brittney and her dad are very close, so she thought it would be a nice moment to do a first look with her dad. This special moment for both of them was captured by Val Smith, who she knows personally, which added an extra layer of intimacy to her wedding. You can see how touched Brittney was as she walked down the stairs to see her dad, and as she waited for him to turn around. The last picture sums up their emotion perfectly; they were both so excited to see each other and her dad was excited for her on her special day. 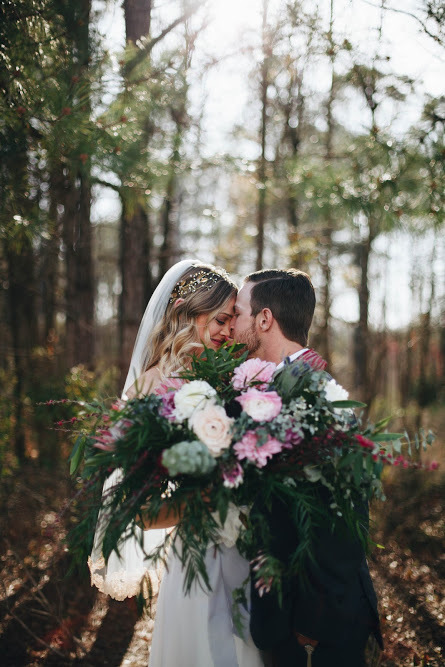 Jesse Johnson from Willow Event Designs, an event design, planning and floral design company based in South Carolina, designed Brittney’s special day. Jesse is the mother of Savannah, Brittney’s Best friend and Maid of Honor. Jesse made these beautiful flower arrangements for bouquets and designed many of the other elements of Brittney’s wedding. Brittney had a family style dinner at her wedding, to create an extra level of intimacy for her guests. Her guests had a great time dining together and dancing later on in the evening. Some of Brittney’s initial hopes for her wedding were to have guests to enjoy themselves, lots of dancing and fun food and drinks and she did just that and more. Check out the gallery to see more photos from Brittney’s wedding.